Today REAST held a Radio and Electronics car boot sale and BBQ as an opportunity for members to sell some things to raise funds for the upcoming Miena Hamfest as well as being an opportunity to acquire some treasure as well. It was fantastic to see some 16 sellers on site today, having on offer a huge variety of wares including a variety of vintage/classic radios, some more modern radios (there was an IC-7300 and flex SDR gear on offer), along with a variety of accessories such as components, power supplies, microphones and more. The only thing missing were buyers, with sellers trading between themselves for some part. Some real bargains were missed out on! The BBQ was a huge success, selling out of all the meat on offer and also raising funds for the Association. It was clear that based on the activity today that Radio and Electronics Car boot sales may have to become a more regular event to encourage more people to come along. Thanks to everyone involved in this great day! On Wednesday evening, ABC Radio Hobart contacted us through our Facebook page wanting to know if someone would like to talk about the experimenters night and what happens at REAST. Justin VK7TW made a detour from his regular sojourn to the club rooms to visit the ABC studios and give an interview on the things that have been happening recently on Joel Rheinberger’s Evening’s show. With permission from ABC, we can share the audio of the interview below. Congratulations Justin on the great interview! 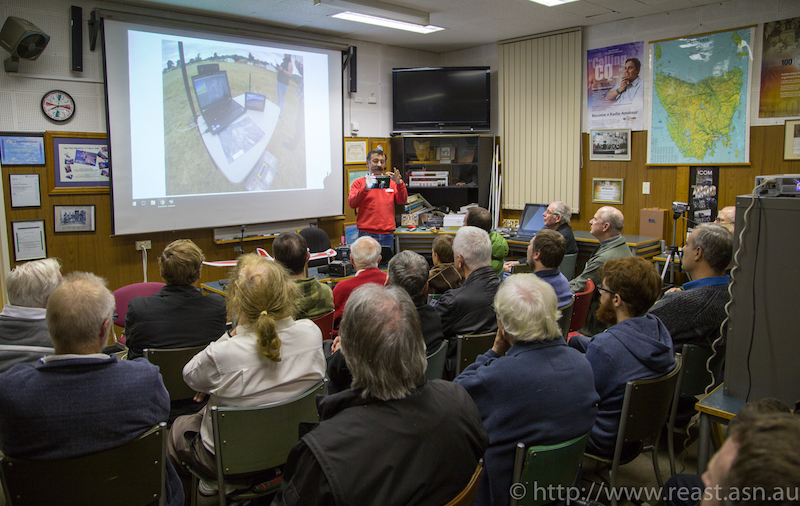 On Wednesday, REAST repeater officer Damien Styles VK7SD commissioned the new Yaesu DR-1X digital repeater much to the excitement of the gathering of people at the Wednesday evening experimenters group. While the repeater was purchased some time ago, it has only been in the last couple of weeks that frequencies have been allocated by the ACMA for it’s usage. The Yaesu DR-1X is capable of both analogue and C4FM digital voice and automatically switching between the two modes. Soon an additional module will be acquired to provide DMR, DSTAR and p25 digital voice capabilities. This repeater is on air right now, with an output frequency 438.675Mhz with a 7Mhz negative offset for the input on 431.675Mhz. Our repeater officer would be most interested to hear signal reports from you. If you are able to access the repeater, please let Damian know by emailing [email protected]! Following a great deal of interest in Digital Radios, repeaters and DMR radios, REAST is arranging for a series of club bulk buys of the Radioddity GD-77 DMR Handhelds. These are available for purchase from the club for $120 each ( $130 for non-members ). You may have seen these available online in the usual places, but unlike other sellers these will be setup and configured for you so that all you need to do is enter your callsign and you will be on the air. As part of work to clean up the Clubroom, a number of surplus items are being made available for sale by tender to financial REAST members. The catalog of items for tender is available in the members only area of the web site, as well as a paper copy on display for members in the Clubroom. The Tender will close on midnight Monday the 30th of July, with emails sent to the successful bidders shortly afterwards. Further details on how to bid are included on the cover page of the tender catalog. If you have any questions please email [email protected] for further details. If you have not been around the Clubroom,or had the chance to use VK7RAD recently you may not be aware that work has started on the upgrade of REAST’s Repeater Infrastructure. 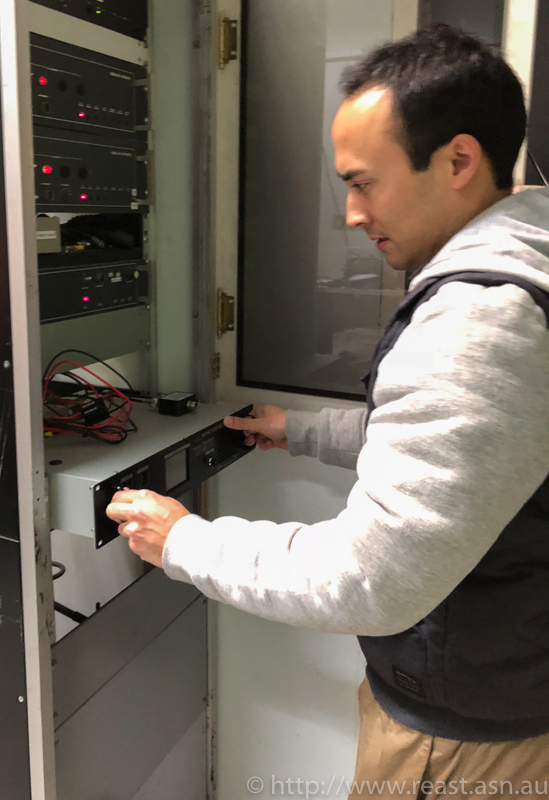 Recently Damien Styles (our new Repeater officer) installed a Spectra MX-800 Repeater, replacing the trusty old Phillips 814 that ha served for many years. Word has it that the more modern hardware has resulted in a noticeable improvement in audio quality. Don’t take my word for it – get on air and give it a go ! For those of you asking about the Yaesu DR-1 – we are (still 🙁 ) waiting on the license variation to get additional frequencies for this and when we have the OK from ACMA we will be getting that up and running to ! 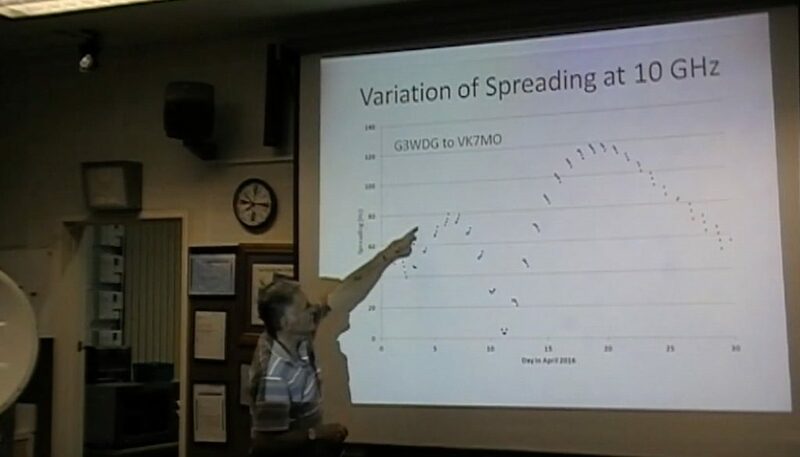 Wow, Rex Moncur VK7MO gave us a four part illustrated presentation on his 18,000km journey on his recent 10GHz Grid Square chasing EME DxPedition. Rex traveled far and wide into VK3, VK5, VK6 and VK8. Rex started with a short presentation on the VK6 Northern Corridor Radio Group as he was very impressed with this club and the things they get up to. Rex then moved to a tutorial on EME propagation and then moved to his grid tour and get OK1KIR up to over 100 grid squares on 10GHz EME. These grid squares were from the OH, OG and OF grid fields. There were a few interesting and frustrating things that happened along the way but Rex achieved his goal! 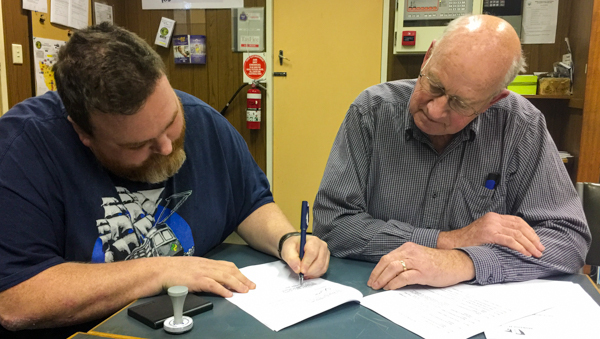 Earlier this week members of the REAST Management Committee met with a representative from Tasmanian Maritime radio to sign a long term lease, securing access to the building for ten years, with an additional ten year option. The signing of the lease ensures that members will be able to enjoy the clubrooms that have been the home of the WIA Tasmanian Division and then REAST for over 25 years. Particular thanks goes to Barry McCann who has been instrumental in negotiating and securing the lease with the Hobart City Council and ensuring that the interests of REAST members were maintained. Wow standing room only for our REAST member Ron Cullen’s presentation on some very impressive radio control kit. Ron started with some history of his Radio Control (RC) journey starting in 1979 when he was in the Air Force and they had an Aero modelling club and even showed and RC controller from that era. Ron was posted all over Australia and he took his RC planes with him. Zoom to 1998 and Ron left the Air Force and shelved his interest in RC. A couple of years ago he started to get back into it. The night Walrus was his first purchase and some VR google was he first foray back into RC. This included some interesting innovations including a Visual Approach Slope Indicator for his RC planes and this mirrors the use of this technology at commercial runways. The Dish Mount and Controller Forum had us Spinning! Richard VK7ZBX’s impressive 1.8m mobile dish. We had a great roll up to our forum with many people coming along with show and tell. Notable there was a large 1.8m AZ/EL dish that was trailer mounted that Richard VK7ZBX brought along – more on that later. The night was all about sharing people’s experiences. We started with Rex VK7MO who took us on a picture journey of his adventures in dish mounts starting with 1296 and working through each iteration of the mounts and heading into the 10 & 24GHz telescope mounts with milling machine table used for accurate azimuth adjustment. Rex’s show and tell included the azimuth and elevation measuring devices. Thanks Rex.